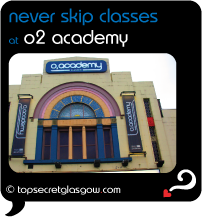 O2 Academy Glasgow sits close to Bridge Street underground station, in the former New Bedford Cinema. When it opened as a versatile concert venue, it began attracting many of the most popular groups around. Erasure, The Human League, Bjorn Again, The Fratellis and The Killers are just a few of the big names to play to delighted crowds here. In fact, it can hold up to 2,500 guests, which means the energy and vibe are HOT... to say the least! The fairly steep gradient of the floor help everyone to get a great view of the fun on the stage. When festivals take place in Glasgow, it really does make a popular venue. So you can expect, for example, groups taking part in Celtic Connections to perform here. And Comedy Festival acts to make a few appearances here as well. Great news! Finding this page means you can now join our VIP list for O2 Academy. Grab your very own web page all about O2 Academy. Do you have a special story about O2 Academy? A funny experience? A grand occasion? A funky photo? A personal tip? A top secret? underground Bridge Street in the hood!